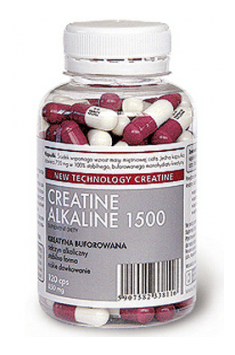 CREATINE ALKALINE is the latest generation creatine supplement, produced in accordance with the description of the United States Patent 6,399,661. Product facilitates transportation of phosphoric compounds used in protein synthesis. Creatine maintains approriate ATP level (adenosine triphosphate) in muscles, which allows muscular fibers to work at their best during physical effort.Creatine takes part in fatless muscle mass building and increases muscle strength. 2-3 capsules in the morning on an empty stomach and 2-3 capsules before or after training. 2-3 capsules in the morning on an empty stomach. There are many ways of taking creatine. A few years ago it was common to take "load" and immediately after that - use cycle. This method is now rarely used. Now we know that creatine can be taken a whole year without any loss of efficiency. It is also known that it is best to take it on an empty stomach or between meals. It is very important that people who take creatine, made sure to drink plenty of fluids, minimum 2-3 liters a day. sodium carbonate, magnesium glycerol phosphate, natural flavor, maltodextrin, magnesium stearate- anti-caking agent, porcine gelatin- capsule.